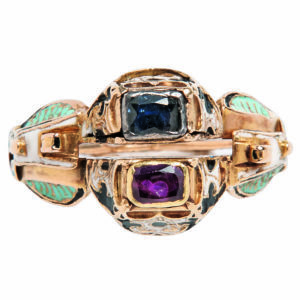 Skinner December 4th Important Jewelry Auction features Colored Gemstones and Historical Jewelry | Skinner Inc.
We are excited to offer the collection of Edith Weber Antique Jewelry. Founded in 1960 by Edith Weber, the firm quickly became one of the leading antique jewelry dealers in the United States. Her son Barry and his wife Sonja Diamond-Weber joined the company in 1975. Barry Weber appeared on fifteen seasons of the Antiques Roadshow and was a specialist in historical jewelry. He taught antique jewelry appraisal classes at several colleges and universities, pioneering a series of hands-on seminars educating on the intricacies of the identification and evaluation of antique jewelry to novices and seasoned industry professionals. Jewelry from Edith Weber was worn on the red carpets of the Academy Awards and graced many major national magazines. Their store at The Carlyle; described as a historical jewel box with esoteric jewelry spanning the centuries. Barry Weber said “we are fearless in our taste,” always searching from the rare and beautiful rather than an easy sale. The “big three” of the gem world are well represented. 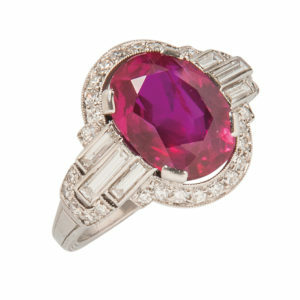 Leading the group is an Art Deco Platinum, Burma Ruby and Diamond Ring of exceptional quality (Lot 138, Estimate: $40,000-50,000). An unmounted Colombian pear-shaped emerald (Lot 316, Estimate: $5,000-7,000) with no evidence of enhancement is already drawing interest from collectors around the world. Burma and Ceylon sapphires are also represented in the auction, including a Platinum, Diamond and Sapphire Ring, set with an approximately 15 carat Ceylon sapphire (Lot, 172, Estimate: $15,000-20,000). The largest stone in our collection of diamonds in this auction is a 11.04 cts. round brilliant-cut diamond (Lot 350, Estimate: $30,000-50,000). We are pleased to offer a wide range of diamond solitaires ranging in size from 1 cts. to over 6 cts. This sale has a strong collection of antique and period jewelry from several notable collectors. 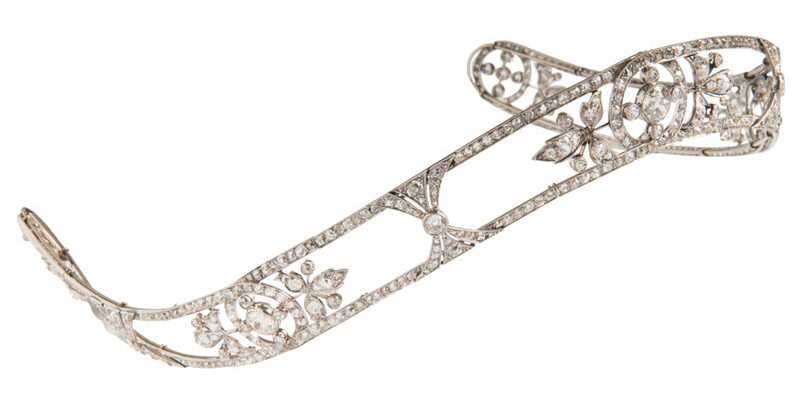 Standouts include a rare Van Cleef & Arpels “Raja Playing Lute” Brooch from the 1940s (Lot 183A, Estimate: $5,000-7,000), an Edwardian Platinum and Diamond Tiara (Lot 125, Estimate: $8,000-12,000) that has passed in one family for the last century, and a whimsical Art Deco Platinum, Hardstone and Diamond Bonsai Tree Brooch by the Austrian “Jeweller to the Kings” Ernst Paltscho, circa 1920, (Lot 159, Estimate: $3,000-5,000). Open for bidding from November 27th through December 5th is a complement of Jewelry offered online-only. Available for preview in Boston with the live sale, the sale offers curated material in a convenient bidding format. Previews for the auction will be held in Boston on Sunday, December 2, 12PM-5PM and Monday, December 3, 12PM-7PM. Free and open to the public, specialists will be on hand to answer questions. Auction catalogs may be purchased at on the Skinner website or by phone at 508-970-3000. This entry was posted in News and tagged antique jewelry, art deco jewelry, buy jewelry, diamond jewelry, diamonds, Edwardian jewelry, emeralds, fine jewelry, jewelry, jewelry auction, jewelry auction in boston, online jewelry auction, period jewelry, private collection, rubies, sapphires, Skinner auction, Van Cleef and Arpels by Skinner. Bookmark the permalink. Canadian precious coloured stone collector. Great post!! I really like your precious commodity. Please keep sharing.